Superman drifts in space, having survived a seven megaton blast that was once Captain Atom. While scratched and scruffy, Superman has survived. He speeds to Wonder Woman's side, and finds her unconscious. The Flash is called in, and he's informed that Captain Atom tried to kill Superman, with assistance from the US Government and Batman. Superman returns to the Fortress of Solitude to be certain that his parents are safe. He finds Green Arrow alone with the Kents. Arrow makes a move for the "super-pills," but Superman intercepts him, so Arrow draws his bow and fires a shot that rebounds off Superman into Jonathan Kent's shoulder. Superman slaps Arrow senseless, but Green Arrow is able to fire off a last shot. Martha Kent pleads with Superman to spare Arrow, but to no avail. Outside of the Fortress, Batman and company wait. Batman picks up the signal from Arrow's locator and sees it attached to the last arrow that was fired, along with one of the super-pills that he attached. Batman wants to wait, but Black Canary begins to leave, acknowledging that Green Arrow is not coming. Story - 4: This issue was one to leave a man floored. There are so many ways to approach it, but they kept getting lost by the sheer weight of such an implausible situation happening between these characters. 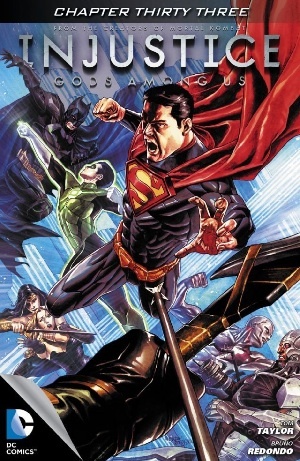 Everyone is out of sorts, from Superman to Batman to Green Arrow, and it's a complete and utter mess... but damn a man if it wasn't entertaining. It is hard to balance this prequel story with what is shown in the cut-scenes of the Injustice video game. Regime Superman is shown as a dictator, but not an out and about murderer... at least not until further in. The reading of the comic makes one wonder what took him so long to kill those that he does in the video game proper. Again, Captain Atom can't beat Superman. Seven megatons of nuclear power and Superman might as well have taken a nap (those it does make you wonder how many megatons that missile was in "The Dark Knight Returns"). It makes you wonder why Atom thought he could kill Superman or had any chance whatsoever. The blast would have to do enough damage to not just deplete Superman's solar stores, but keep him from storing any further, which nuclear radiation just doesn't do to Superman. We saw this in Kingdom Come, and it's not surprising to see it here, seeing how much has been borrowed from Kingdom Come already. It's an extremely poor plan on Batman's part. He has no contingency for when Superman shows up, but also no plan for when Superman survives the fight with Captain Atom, which couldn't have lasted longer than a few minutes. Batman had said to Arrow that he would return for him when Superman left, however, while Superman does leave, the plan seems to have changed to Green Arrow somehow making his way to Batman and the others. Green Arrow for his part cannot think of anything better to do than remain with the Kents, and when Superman arrives, he doesn't surrender, no, he attacks him with an arrow. Batman didn't supply him with any Kryptonite for the mission, but gave him a nifty tracker that was as worthwhile as Bat-Thermal Underwear. It's telling that Martha didn't jump in front of Superman to stop him. She obviously doesn't believe that Superman wouldn't kill her too in his rage, and it's a rage directed at the wrong person. Superman doesn't inspect the premises for Batman. What's more, he doesn't detect Batman at all with those great senses of his, which is convenient for the Dark Knight, and the death knell for the Emerald Archer. Wonder Woman conveniently fell in the same area from space, which is a great trick as the Earth rotates, and as she wasn't doing the same...well, at the end of the day, realism in fiction is selective. If not, most of this would have never happened. Still, it's a pretty gripping installment, as we finally get to see Green Arrow do something that shows him as competent and not comic relief. The passing of Arrow is quite sad, but not maudlin, as he reminds us where his thoughts begin and end. Regime Superman is a cold-blooded killer, and nothing and no one is going to redeem him. The Kents are ineffectual parents, and pretty much want to be saved from their son; the one who they placed such a strong moral code within, but also the one who didn't turn to them when he killed Lois and his unborn child or before he killed the Joker. This issue is a great reminder of why Superman works as a benevolent figure with an unbreakable moral code, and why he doesn't when allowed to live in the fallacious "grey" area between right and wrong. Batman is a straightaway jerk. How many people have died on his watch so far? All to stop Superman who still hasn't done anything yet. Batman going into the Fortress for the pills is akin to Regime Superman breaking into the Batcave for the Kryptonite. What's more, his planning is suspect, and he has no answer for Superman at all except to run. Two of his biggest assets are off the board, and it's doubtful he'll be replacing them soon if at all. It was a very entertaining issue, like watching the Real World with Justice League characters; you just want to see what simpleton move they'll have at next. Art - 4: While Black Canary is drawn to look like she's been eating one too many birds, the rest of the art works well. Superman looks positively evil, you can see Arrow's fear, and Batman looks like his cowl was a dunce cap, all perfect images for what this issue has to offer. Cover Art - 2: Are you sure that's not Kyle Rayner?